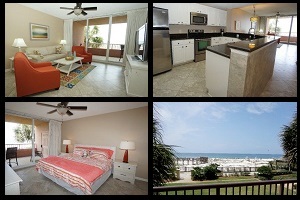 Property Info: 2 Bedroom, 2 Bath beachfront condominium with 1000+ sq. ft.
Beach Club luxury condominium home for sale in Gulf Shores, AL. Beautiful resort home with incrediible views of the Gulf of Mexico. This condominium includes numerous upgrades such as granite counter-tops, stainless steel kitchen appliances, tile flooring throughout, walk-in tile showers and new furniture. The Beach Club is a true resort community with all the amenities you would expect at a gulf-front development. Whether you are looking for a real estate investment, or a second home, this could be what you are looking for. Impeccable landscaping greets you as you enter this popular gated complex. Community amenities include tennis courts, indoor/outdoor pools, green areas, hot-tubs, spa, exercise facility, BBQ grills, onsite restaurants & more…don’t be late, come see this resort home. View this >>> Beach Club Condo in Gulf Shores AL.